The carver 400 motor yacht is well balanced between comfort and function, the spacious saloon area comes with great seating environment,feels like home. 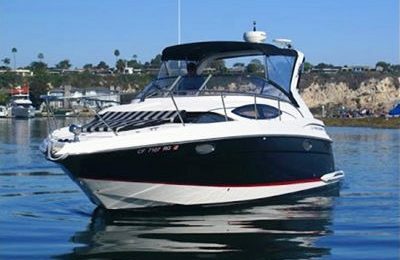 Step up to the fly bridge, laid back, have a scenic cruise over the water,the area can be fully enclosed while the weather is getting chilly or windy,the comfort is guaranteed no matter any weather conditions. Feel the sun and ocean breeze on front deck, have a sun bath on the sun pad, enjoy the time in the middle of blue ocean ,far from the shore. 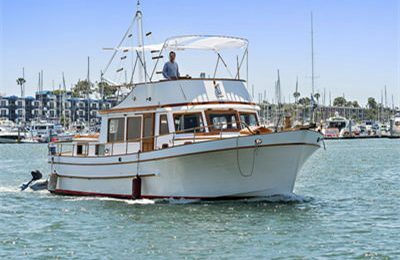 Bellow the deck, there are 2 good sized state rooms with own heads(bath room) with plenty of storage, great for over night trip to Catalina island. 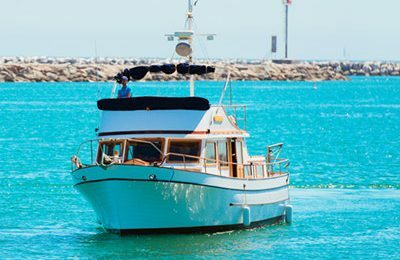 Base price includes 4 hours all inclusive private yacht charters out of marina del rey, extra hours are available for book while check out. A medium size 40 feet Carver 400 motor yacht with fly bridge.2 sleeping cabins,2 heads(restroom), 2 sets separate audio system with blue tooth connection. A/C and heater available. Just enjoy the ocean and sea breeze with California sunshine, have a picnic or BBQ over the water.